I have a confession. I have never knit a Stephen West pattern. I started his mystery shawl two years ago, but I can’t remember what happened after the very beginning and I set it down never to touch it again except to rip it out a year later. About a week ago after seeing a gorgeous Spectra at Magpie I had to go for it and went straight home to buy the pattern. 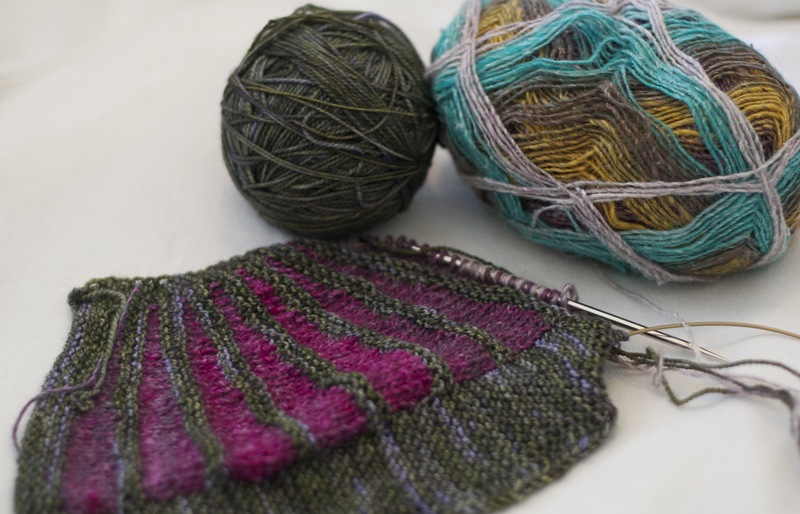 I knew with my overflowing stash, it was going to be a stash dive for the yarn, but here’s another confession… I have a ton of Silk Garden Sock which is one of the yarns used in the pattern. The problem was deciding which color to use. I settled on S84 and a ball of Madelinetosh sock in the lichen colorway that I bought years ago. I’m only a few blocks into it and I’m loving the pattern. Now which Stephen West patterns to knit in the future. I can already see a Daybreak or a Pogona jumping onto my needles as soon as my Spectra is done. I’m thinking about using more of my madtosh stash for the Pogona and maybe some leftovers from other projects for Daybreak. Both will most likely be knit this year.